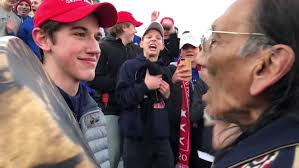 Many have asked: Where were the chaperones during the confrontation between Covington Catholic High School students, Native American marchers and Black Hebrew Israelites in Washington, D.C., on Friday? It turns out there were at least five on the scene, one of the chaperones told the USA TODAY Network on Monday. The kid was smirking, it was observed widely. Sorry to disagree, but I taught high school for several years and I’ve seen that look more than a few times. That’s a smirk.